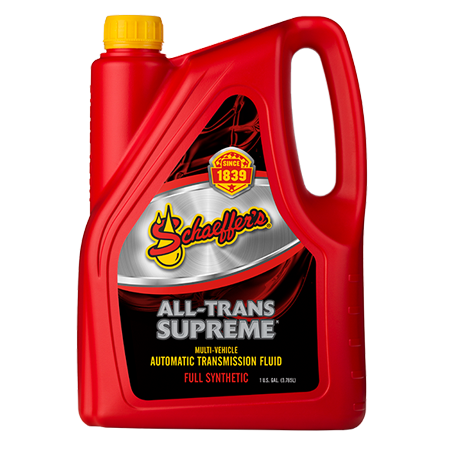 All-Trans Supreme® is formulated with a special blend of synthetic base oils, a highly shear, stable viscosity improver and a multi-functional additive package. This unique blend creates a full synthetic automatic transmission fluid that significantly reduces transmission wear and offers multi-vehicle performance. All-Trans Supreme® provides the proper friction retention and stability needed for long life performance, smooth lock-ups, wear protection and anti-shudder durability required by a wide variety of vehicles. All-Trans Supreme® is recommended for automatic transmission that specify the use of Dexron®-III; MERCON® and MERCON® V; Chrysler ATF +3 and +4 type fluids. It contains the frictional properties, wear protection and viscometrics needed by Asian and European automatic transmissions.